I got to review two of their games! I got The Newlywed Game and the X-CETER-O game! My hubby and I have been having fun playing The Newlywed Game! It came with a board game plus DVD game! It's fun to see the answers and how well we know each other. We are even learning a few new things about each other! Next my family and I have been playing the X-CETER-O game! This is great for 2 or more players ages 7 and up. No more ties with this game, always a winner! We love and are really enjoying playing both the above games! Thanks Endless Games for the great games! 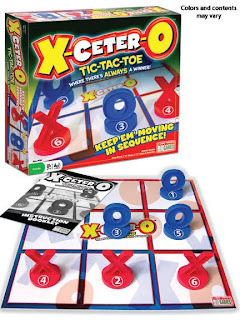 X-Ceter-O, an enhanced version of the much beloved game of Tic-Tac-Toe where somebody always wins. To make it fun for all ages, X-Ceter-O puts an imaginative twist on the classic game. Every set includes six magnetic game pieces – three O’s marked “1”, “3” and “5” and three X’s marked “2”,”4” and “6” – along with the familiar 3x3 game board grid. The pieces are played in numerical order – that is, the “O” marked “1” goes first, followed by the “X” marked “2”, and so on. Once the six pieces are on the board, play continues in sequential fashion, with each move exposing the now-vacated square to the opponent. The action ends only when the first player to achieve the once-unthinkable, three-in-a-row combination, wins the game. Founded by industry veterans Mike Gasser, Kevin McNulty and game inventor Brian Turtle, Endless Games specializes in games that offer classic entertainment and hours of fun at affordable prices. To learn more about the company and where to purchase it's unique line of entertainment products, visit www.endlessgames.com. to give away one X-CETER-O game! You always have the best giveaways Shauna! We love to play games at our house! I'm a follower of this blog. Sounds like a fun game. Looks like fun. Count me in. New game to me. Thanks I want to play it! Voted for your fabulous blog. Cute. Looks like a blast. I follow this blog! Hope I win! Have your Trying To Stay Calm button up, check! Have your Book Giveaway button up, check! Have your Seeking Sisterhood button up, check! This looks like a blast! When I play my granddaughter, maybe I'll even win! Following Trying To Stay Calm as Wanda. Following Seeking Sisterhood as Wanda. Following Book Giveaways as Wanda. I have the Sisterhood button! I have the Trying 2 Stay Calm button!